You know, it’s not often that I feel nostalgic for the days before suffrage. 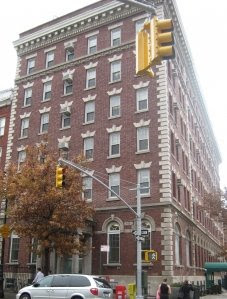 Today, however, it occurs to me that, were I living in that day and age, I could at least have an apartment in Manhattan – namely, the Trowmart Inn. According to Ephemeral New York (and this article, thanks for linking, guy) it was a “handsome hostelry” for ladies “of the class who [labor] for a small wage, and whose parents have no home within the city.” Why, that’s me! What sort of accomodations were provided for such ladies, pray tell? For $4 a week, a girl could have a single room containing a bed, washstand, and table, plus breakfast and dinner. You also got a library, a “good-sized laundry with porcelain tubs,” access to a “medical woman” who worked on the first floor, and, as the Times points out, plumbing which was thoroughly “modern and scientific.” In addition to this, there was no curfew, so you could gallivant around at all hours in a manner most unbecoming. Furthermore, the building’s owner, William Martin, was a man with a mission: to improve your love life through superior real estate. Well, maybe. At the very least, they could develop into people who could say “come over to my place” without feeling the blush of housing-related shame. There were apparently lots of lodging houses for working girls scattered throughout the city, but, as one letter to the Times points out, they had a significant problem: women who earned “too much” couldn’t get rooms there, even if they couldn’t really afford anything else. This was written by Sady. Posted on Thursday, November 20, 2008, at 10:26 am. Filed under Uncategorized. Bookmark the permalink. Follow comments here with the RSS feed. Both comments and trackbacks are currently closed. You know, they actually still have (at least one) women's boarding house/s in the city, or did a few years ago; I knew someone who lived in one while finishing her PhD. She was paying something ridiculously low, maybe 500? for a room. And I seem to recall there were even free breakfasts! I was very envious. Of course, No Men Allowed after hours. But then, that wouldn't be appropriate for Girls of Gentleness and Refinement! ‹ My, What An Interesting and Exciting Day!